It’s a strange time to be Noel Gallagher. Having dominated both prior commercial heavyweight bouts with his brother Liam in the charts, rolling over Beady Eye’s two lacklustre efforts with his initial pair of High Flying Birds records, he finds himself edged out on sales points the third time around, with his younger sibling’s first solo album proper proving to be an unexpectedly big hit last autumn. On artistic merits though, he is still head and shoulders above, not least aided by latest LP Who Built the Moon? 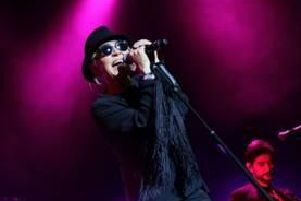 ; hailed as the strongest of his post-Oasis efforts yet, it comes with the additional caveat of ensuring the 50-year-old now has enough material under his own name to fill a gig without the need to rely on his old band. The first half of this somewhat leftfield performance on a sweltering May Bank Holiday evening at Leeds’s First Direct Arena plays like a rebuttal to that mid-Nineties heyday. Gallagher opens with four songs from Who Built the Moon?, chief among them the horn-drenched glam strut of Holy Mountain, before subsequently working backwards through his career, effectively tracing his lineage. A handful of Chasing Yesterday tracks, anchored by Riverman’s woozy sax, are succeeded by a brace from his self-titled debut and a pair of latter-day Oasis singles led by lad-love terrace singalong Little by Little before he returns to the new record. As arena shows go, its reverse linearity is a challenging gamble; that it pays off is down to the beefy versatility of the High Flying Birds, who ensure the mood rarely dips below entertaining. Gallagher opens up as the night progresses, sparring with the partisan Yorkshire crowd about football and cheekily swearing at them in typically acerbic, lacerating form. He has the luxury of not needing to win them over; they respond as vivaciously to the breathtakingly gorgeous Dead in the Water as they do to AKA… What a Life!‘s shimmering dance-rock or the arms-aloft communality of Wonderwall, which spawns beery delirium. A closing encore of the Beatles’ All You Need is Love is arguably superfluously redundant on the back of a swelling, semi-acoustic Don’t Look Back in Anger, recast in the past year as an anthem of solidarity and defiance; as he heads off to continue celebrating the triumph of his beloved Manchester City, Gallagher saves the most stirring reminder of his brilliance for second-to-last. Try beating that one, Liam.